2019 UPDATE – Unfortunately, there are no Juicer blender combos on the market that I recommend now. The only two choices that I recommend below have been discontinued by the manufacturers although they are still for sale on Amazon. I will update this post if new models are introduced onto the market. 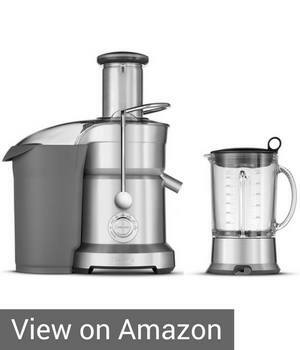 If you are really set on getting a juicer blender combo appliance, then you can still buy one of the discontinued models I recommend below or buy a high quality blender like a Vitamix that can really puree the ingredients to juice-like quality (see my Vitamix buyer guide). You can make specific “juicing” batches in the blender and strain it through a fine mesh sieve to create a juicing equivalent. I own multiple blenders and a juicer and have made a LOT of smoothies and juice. I personally prefer smoothies because of they are filling and offer more variety but juicing does have its benefits too. Having a machine that can do both is a great idea so I put together this guide for finding the best juicer blender combo if you want a 2-in-1 type of product. Surprisingly there are not a lot of choices when it comes to juicer and blender combo appliances. In fact, some are just awful as they don’t juice well and waste most of the ingredients. The models that I chose below offer the best performance, features and feedback among the available options on the market but understand that there really are very few choices. I will continually keep this juicer blender combination guide updated if new models are introduced. Is a Juicer Blender Right for you ? There is often some debate based on which type of green beverage is best — a smoothie or a fresh pressed green juice. Some fans of each drink type argue about this endlessly. I drink smoothies and green juices and they both have their advantages which is why finding a juicer and smoothie maker combo is a good idea for some people. See my detailed Juicing vs Blending post for more information. Really the main difference is that blending includes the entire pulp whereas juicing extracts the juice only and discards the fiber pulp. Typically an all-in-one appliance is NOT going to be perfect at everything compared having separate specialized appliances. The combo models are fine if you are looking to do basic juicing and blending but they can be limited. Also, all of the juicer blender combo units on the market are centrifugal juicers but some people prefer slow masticating juicers. Also, the blenders in the blender juicer combo units work fine for tasks like making smoothies but they won’t offer the versatility of a high powered blender if you intend to grind, make nut butters, make dough, or other more difficult blending tasks. Note that there is a lot is confusing claims your will hear when people compare fast vs slow juicer. Claims about heat in fast juicers destroying nutritional yield or fast juicers adding air which oxidizes the juice and hurts. Also, it can be confusing because blender companies advertise that their blender can juice with terms like “complete juicing” when in reality they are just blending since they aren’t removing the pulp. In summary, the juicer and blender combo’s are fine for standard blending and juicing task but….. If you are going to make a lot of juice then you might be better off with an individual juicer. If you want to make more than just smoothies or basic blending then you might find that a high powered blender will provide more versatility. The models I chose below will meet most people’s blending and juicing needs. My top recommendation for a blender juice dual appliance is the Breville BJB840 XL. Breville is a very well respected appliance brand that is known for making excellent juicers and blenders. It is simple to use and saves space by letting you easily create blended drinks, smoothies and more with freshly made juice. It is made of die-cast metal which gives it a nice sturdy feel to it. The blender comes equipped with five variable speeds including options for ice-crushing, smoothie and pulse settings. Meanwhile, the juicer comes with five speeds as well, along with an extra-wide chute and 40 oz jug that even includes a froth separator. Nice features like an overload protection. Good customer reviews. Negatives: It is expensive and some user complaints about issues with the blender rubber gasket. Overall Opinion: The Breville BJB840 XL Juice and Blend is a solid unit for juicing and basic blending. The juicer works like their other popular centrifugal juicers. The blender can handle most blending tasks but can struggle with some higher horsepower blenders. It is a good model that provides nice 2-in-1 convenience but it is on the expensive side. The Oster Juice and Blend 2 Go is a centrifugal juicer with a base that easily converts into a personal blender. I do like Oster blenders which are reliable and well priced but they aren’t necessarily known for their juicers. The Oster Blend and Juice is reasonably priced and offers a decent but basic centrifugal with mesh filter design. The main design benefits of this model are how easy it is to change to a blender and clean up. Positives: Compact 2-in-1 machine that is easy to use and clean. Able to prepare blended juices or smoothies directly into the 20 oz BPA-free To-Go-Cup with lid. Affordably priced with decent reviews. Negatives: Lacks multiple speed options. Juicer isn’t as efficient in juice yield as higher quality juicers. Overall Opinion: A decent but basic model if you want a smoothie blender and conventional juicer. It is well priced in comparison to the Breville but the Oster’s juicer probably won’t perform as well Breville’s. Overall, not a bad model and backed by a reputable brand like Oster. 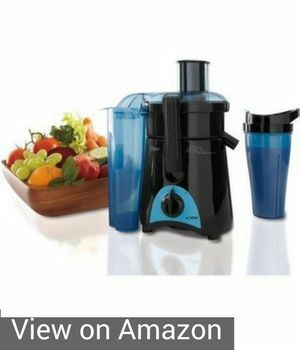 Sharper Image Juicer Blender Combo – I am not sure which appliance manufacturer makes this model for Sharper Image but it has a lot of complaints. Many of the complaints are about how poor the juicer works. Nesco American Harbest JB 50 – This model appears to be discontinued. The problem I have with this machine is the juicer seems very inefficient with a lot of waste. Also the machine is small and the blender strength appears to be equivalent to an entry level blender. 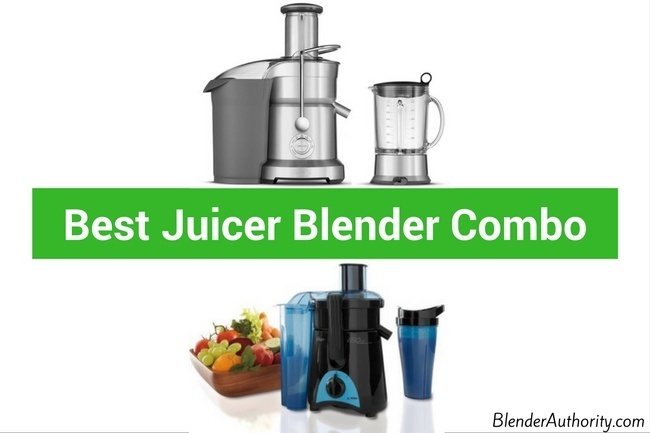 As you can see there aren’t a lot of choices for blender juicer combo appliances but the two we provided offer a nice balance of performance, features, and price. Hopefully the manufacturers will come up with new innnovative designs in the near future. As of right now, you are limited to blender juicer combo models that integrate a traditional centrifugal juicer with a basic blender motor base. 2019 Update – As mentioned above, my top choices were both discontinued. Maybe there just isn’t enough demand from consumers to have a blender and juicer in one device so the manufacturers haven’t introduced new models. Let be know if you have any questions in the comment section below.